While managers in companies large and small may be loathe to admit it, much of their time is likely spent on trying to prevent “wars at work,” as Kaveh Mir calls them. “Almost every workplace issue can be traced back to a clash between differing personalities,” writes Mir, who, as a chief executive officer, faced challenges in his own business and now helps others as an organizational coach. InWars at Work: An Action Guide for Resolving Workplace Battles, he explains how psychometric tools can be used to resolve workplace conflicts. The author incorporates storytelling—a proven technique in business books—to illustrate personality clashes in various areas. In “The Battle of Leadership,” for example, the reader is introduced to John, a department manager, and Ella, a bright young member of his team who isn’t afraid to share her own ideas. Their personality clash divides the staff. Mir demonstrates a possible resolution via another character, the Admiral, who uses a specific psychometric tool (a questionnaire that measures sixteen personality traits in order to predict how a person will react to a given situation) to bring John and Ella into the “Uncomfortable Zone of Debate,” so that they can reach a compromise. Mir applies the same approach to seven other areas: career, communication, decision-making, conflict, team, learning, and change. In each case, the author tells a story, typically about two individuals with clashing personalities, and incorporates an appropriate psychometric tool into it. The Admiral, a recurring character, facilitates a resolution in each of the scenarios, demonstrating how to apply particular tools. His role is to help the reader appreciate “the value of third-party objectivity and professional training to interpret personality measures,” according to Mir. In the final chapter of the book, the author details and describes the psychometric tools utilized by the Admiral, including the well-known Myers-Briggs Type Indicator and numerous other questionnaires, tests, and assessments. 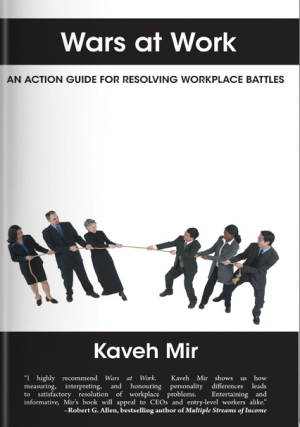 Wars at Work is a brilliantly conceived guidebook in which the author shows both a deep understanding of conditions that lead to workplace conflict and how such conflicts can be resolved. Mir admits that the psychometric tools he recommends require implementation and assessment by an expert, but he believes that applying them will result in “positive conflict.” For most managers, conflict that results in positive change and development would be far preferable to the alternative: disruptive, often divisive, negative conflict in the workplace.